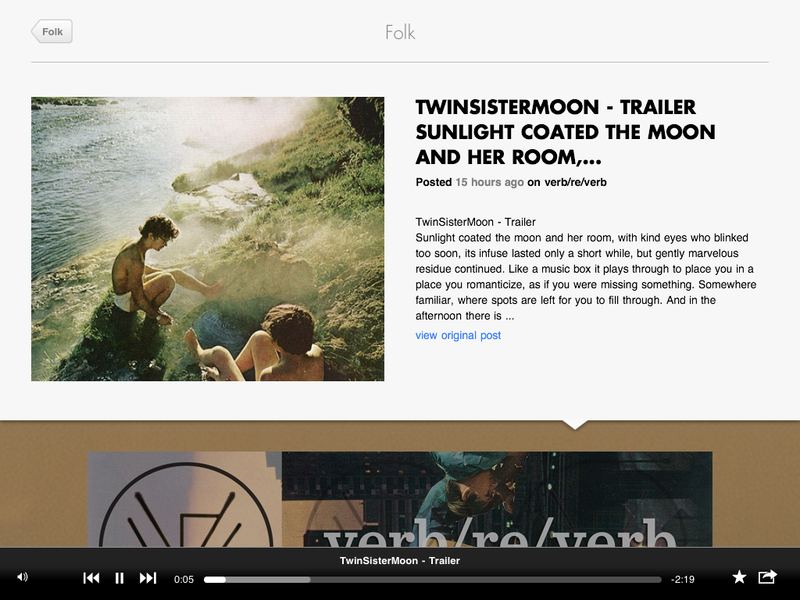 Shuffler.fm, an online Web application for music discovery, received a major update today. Now users can play mixes of their favorite blogs, browse the Web’s most popular songs and artists, create personalized channels and more. But what has us even more excited is the upcoming Shuffler.fm iPad application, which provides a visual way to explore new music, optimized for the touchscreen interface. For those unaware, Shuffler.fm is an Amsterdam-based startup co-founded by Tim Heineke of Twones and Tone.fm, along with Marcel Corso and Diederik Martens. 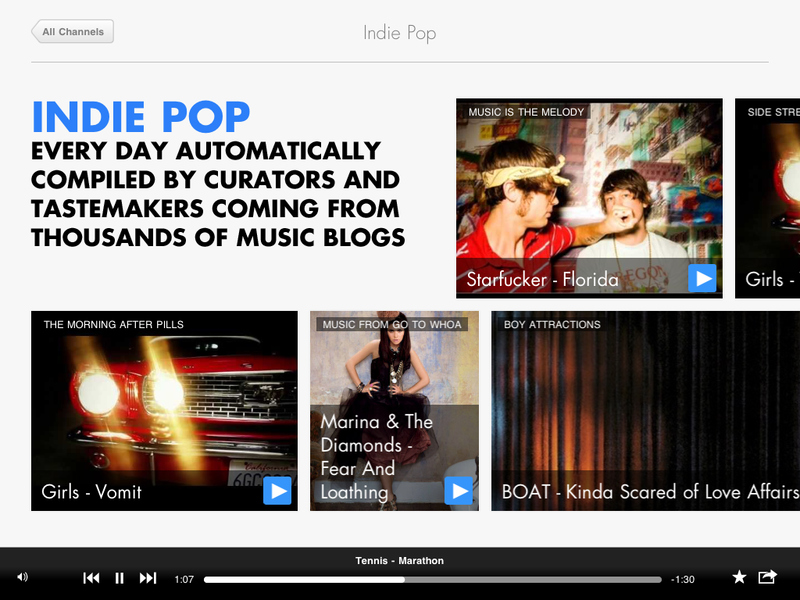 The service’s goal is to aggregate music from around the Web based on genre. Previously, users visiting Shuffler’s homepage would simply pick a genre of their choice, like Indie, Electronic, Hip-hop, Folk, etc., in order to play tracks from music blogs around the Web. The tracks are pulled from a curated list of music blogs, categorized using Last.fm’s API, then filed accordingly. But unlike other popular music aggregators, such as The Hype Machine for example, Shuffler.fm is not just about aggregating the music itself, it’s about providing added context and value. By taking you direclty to the music blog where the song is hosted, Shuffler.fm users have the opportunity to learn more about the track, the band or the artist, as well as the music blogs themselves. 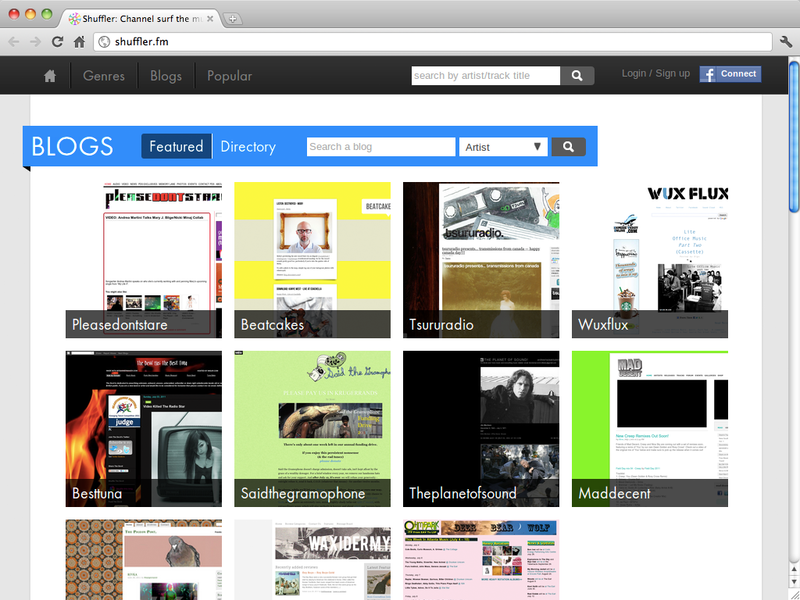 The site has often been described as a “StumbleUpon” for music because of this feature. Today, Shuffler’s Web users will have access to a few more options, including the ability to play a favorite blog as a continuous mix, a search function for finding favorite artists and blogs and a personalized music channel built by favoriting individual tracks and blogs. 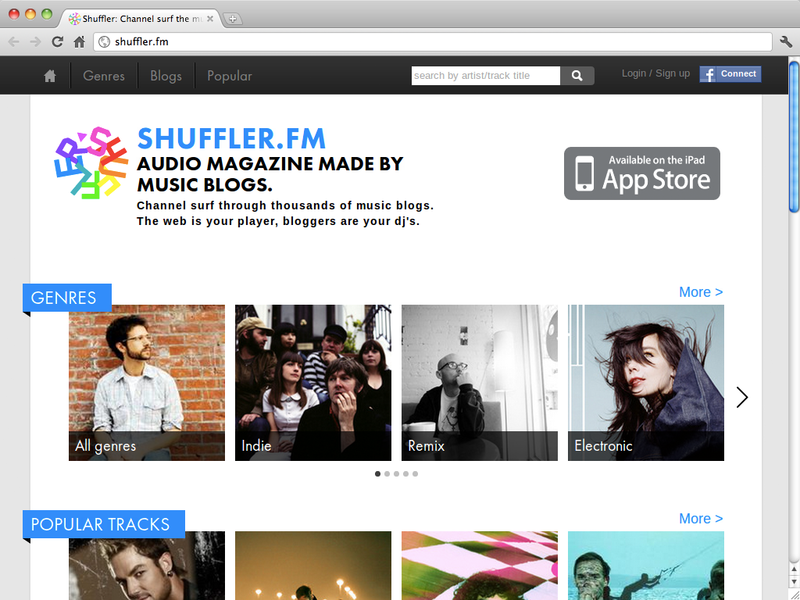 In addition, music blogs can now set up their own accounts at shuffler.fm/blogs. These blogs will offer special features designed for the service, like a “Play this Blog” button which launches that blog’s own channel. All the new features will launch today, at approximately 12 PM EST. We also got a sneak peak at the upcoming Shuffler.fm iPad application, which brings the Shuffler.fm experience to the touchscreen. The ability to navigate through touches and swipes brings back a feeling reminiscent of flipping through album covers and tearing into liner notes, we found. As you can see from the images, the Shuffler iPad app is very similar to the Web version, in that you also pick a genre and surf through blogs. But on the iPad, the app offers a more simplified feature set. Besides the standard play/pause controls and volume button, there’s just a favoriting button and sharing feature, which keeps the interface uncluttered and easy-t0-use. 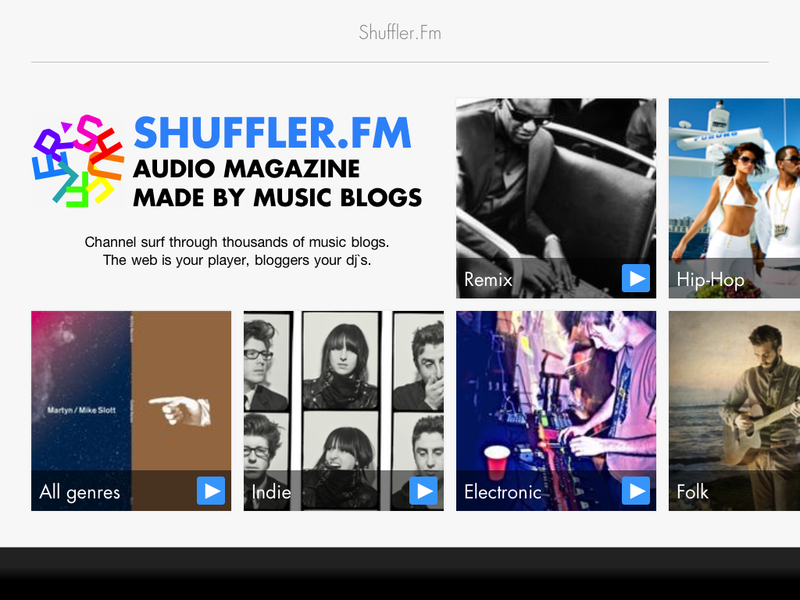 The experience of using Shuffler.fm on the tablet is less akin to StumbleUpon, and more like a Flipboard for music, as it provides that casual, “lean-back” consumption experience the iPad is known for. The iPad app will be out in just a couple of weeks, Heineke says, depending on how quickly Apple reviews it. We’re certainly looking forward to its launch.